Even after his return from Italy, Carl Block continued producing satirical genre paintings depicting scenes from Southern Europe. 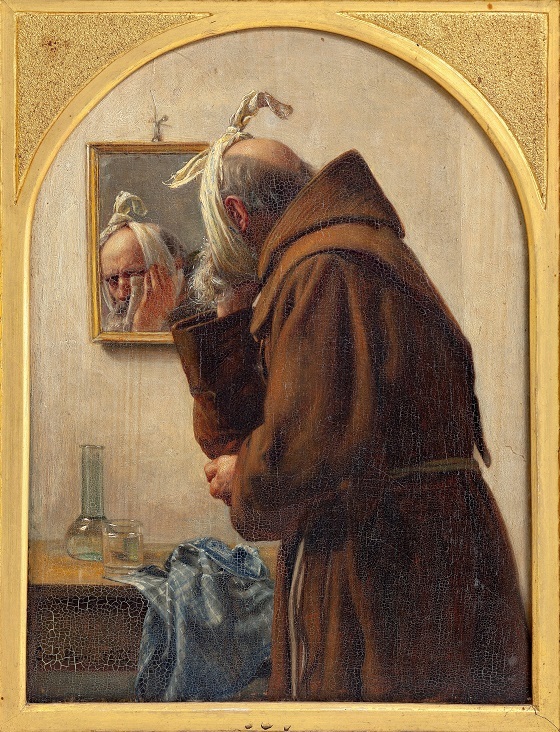 In this comical scene, a disgruntled Italian monk examines himself in the mirror. He has a toothache and has applied a bag of spices to his cheek, keeping it in place with a scarf tied around his head. On the table there is a pitcher and a glass with cold water to further ease the pain if the quirky headwear does not have the desired effect. The artist has portrayed the monk as a humourous and somewhat pathetic character who is making a big fuss out of a relatively trivial everyday problem. The aim of the painting is accordingly not for the viewer to sympathise with the suffering monk, but instead find amusement in his comical and exaggerated response to the situation.